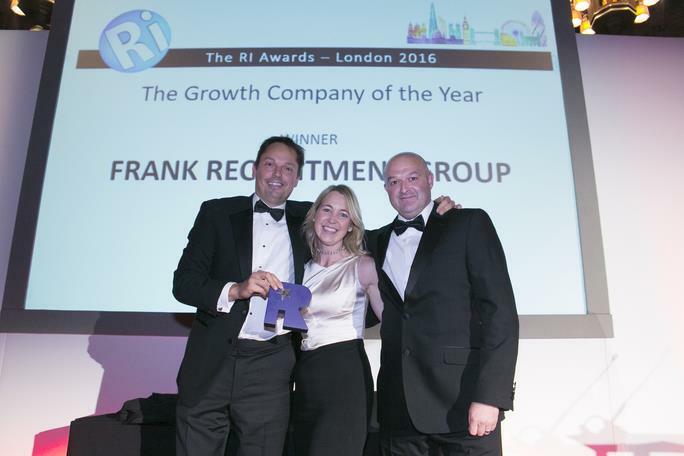 Frank Recruitment Group, the global staffing firm focused exclusively on the enterprise software market, has scooped two awards including Growth Company of the Year at the Recruitment International Awards at the prestigious Guildhall in London. The Tyneside firm, which focuses on the fast-growing technology recruitment market, also triumphed in the Deal of the Year category following a landmark investment from TPG Growth, the middle market and growth equity investment platform of TPG, earlier this year. Since the investment from TPG Growth in April, the Group’s portfolio of brands has increased from four to six through the introduction of Pearson Frank and Anderson Frank. The business has grown to include 1022 employees, from 607 this time last year, with new offices in Berlin and Philadelphia, taking Frank Recruitment Group’s global office location count to 10. The company’s head office is on Collingwood Street in Newcastle. TPG Growth’s extensive portfolio includes numerous companies that, like Frank Recruitment Group, leverage opportunities for disruption – including Airbnb, Spotify, and Uber. James Lloyd-Townshend, CEO of Frank Recruitment Group, said: “2016 has been a landmark year for Frank Recruitment Group, and as 2017 fast approaches we have huge growth plans in place. We hope to add 200 people to our team in Philadelphia alone, as well as opening further offices across the United States. David Head, Director of Recruitment International, said: “Congratulations to Frank Recruitment Group who were double winners at the recent RI Awards – accolades that recognise outstanding achievement in the recruitment industry. Frank Recruitment Group operates six core brands, each focused on recruiting software professionals that specialise in a different technology product. In 2007, the company launched its original brand, Nigel Frank, which recruits professionals who specialise in Microsoft Dynamics. For more information about Frank Recruitment Group visit www.frankgroup.com. For careers or current vacancies visit www.frankgroup.com/vacancies.